District Dinner is an opportunity for a night of fellowship and great food as we acknowledge and thank our adult volunteers for the hard work and dedication that made this year incredibly successful. Raven District’s outstanding leaders at the unit and district levels will also be recognized. All volunteers in Raven District are invited to celebrate a night of celebrating Scouting around the world and honoring our amazing volunteers. The menu for the evening is a choice of lasagna or chicken alfredo, with salad, garlic bread, and dessert. Nominations are due January 6, 2020. Nominate Scouters who have served Raven District youth above and beyond the call of duty for the following awards. Most Valuable Unit Leader goes to a leader from each unit who has contributed outstanding service to that unit. J.P. White Lifetime Achievement Award is presented to a volunteer, couple or family currently active on a unit, district, or council level that have been active over an extended period of time (usually a minimum of 15 years). 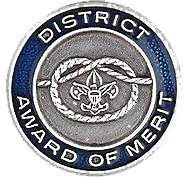 District Award of Merit is given to Scouters who render service of an outstanding nature at the district level. For questions, contact Contact Valerie Richardson or district activities chair.